i am looking at putting rock around my AGP. i have read on here that the rounded stones were the best to use. i also read that people put what is called pond pebbles. going to try to do this, this weekend. i was curious if this is the right stuff? I would use river rock... small to medium sized rounded rocks. Skippy loves to toss out odd and assorted gravel in places that I just cuss and moan about when I step on barefoot. Ouch! He is oblivious to the problem with rough rocks cuz he's a bit of a sissy and *never* goes barefoot. Addendum: Just looked at the link you posted- I had NO idea how expensive the various rocks were. Some are soooo pretty though!! That small stuff is a pain to get rid of if you ever need too as well. I'm planning to use river rock, but I can buy it at a landscape place "by the scoop" (a front-end loader) and put in a pickup bed much cheaper. Check that out before purchasing by the bag. I have it in a rock garden within my circle drive, and I like it. I concur with buying it by the scoop. 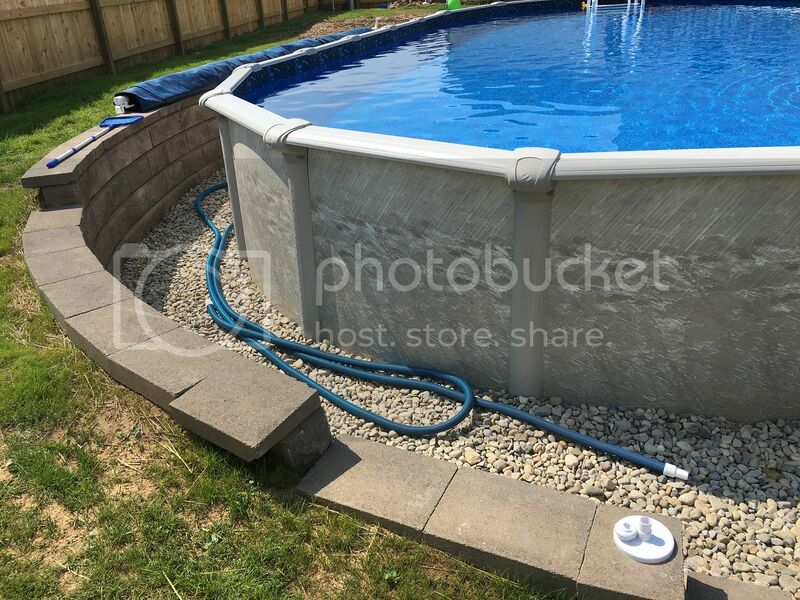 That is what we did when we had our retaining wall and pool installed last year. I have attached a few pics. That is exactly what we have, but lowe's will sell it in 1 ton bags versus the small bags for a fraction of the cost. I think last year it was $30/ton. I used rubber mulch. 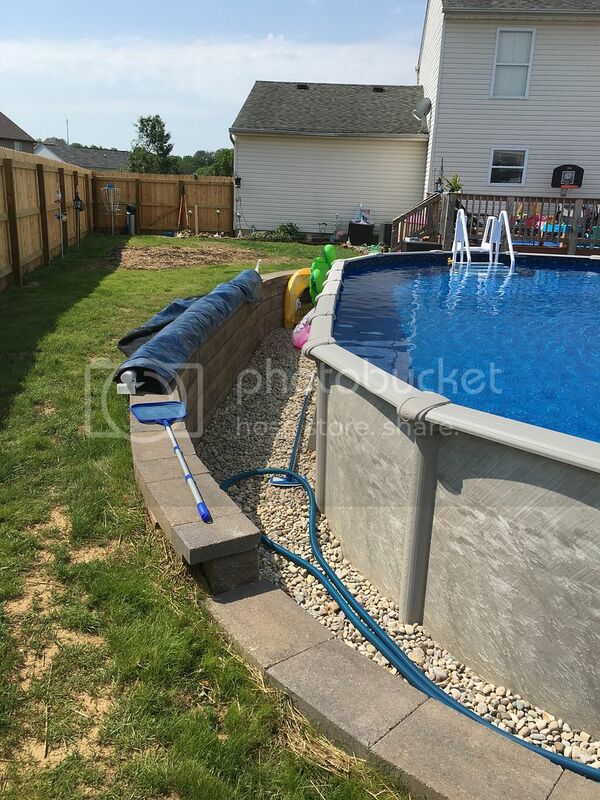 It's nice and soft when walking around the pool, weighs much less than stones, easier to get rid of if you ever wanted to and if any gets in the pool there is a zero chance of it puncturing the liner. i just went ahead and put down regular mulch. home depot had it for 5 for 10 dollars. could not pass it up. spent alot of money on the deck so went with the cheaper route. maybe next year i will go with the rock.